Imposing, purposeful and tough enough to shrug off rough weather, the 36.9 metre OA 120 is a formidable new queen of Ocean Alexander’s yacht fleet. The view from the big sundeck fitted with an elevated spa pool in a nest of sunpads, a central bar and comfortable U-shaped sofa is all encompassing. Bring on the wine and cheese and sunsets. But rough water does not mean roughing it. 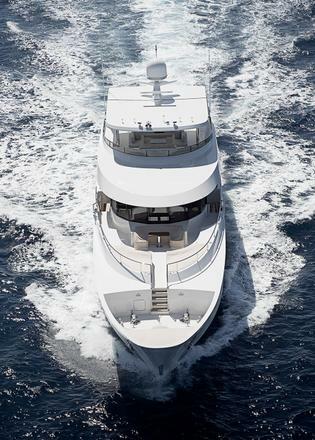 The Ocean Alexander 120’s 255GT of volume translates into handsome spaces with luxurious finishes from a who’s who of fine interior suppliers, from Abbott + Boyd to Zimmer + Rohde. 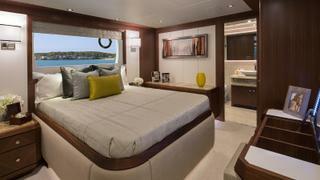 She has all the comforts of a superyacht: for instance, a full-beam master cabin with king size bed and seating area forward on the main deck. In the forward en suite, a central spa tub and shower separate his and hers sides. Heated granite floors, Aurora marble in the showers, worktops cut from Gold Macaubas stone and taps from THG Paris are among the many fine details. Above a glass sink, sliding mirrors uncover large windows with built-in portlights that open to let fresh air in, a feature repeated in all the four guest cabins below. These fan around an inviting lobby with a decorative marble floor and a bar concealing a refrigerator. 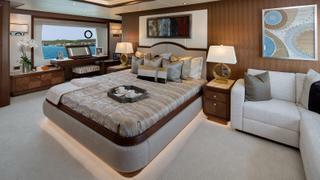 An undetectable panel between the twin beds of the starboard cabin opens to allow the crew in for service. On the other side of the panel are a washer and dryer, a mess with kitchenette and three crew cabins, including the captain’s cabin. 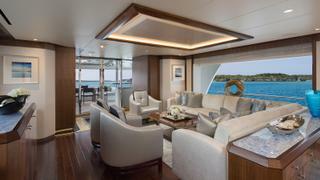 The layout works beautifully for a family but could also cater for a charter programme. 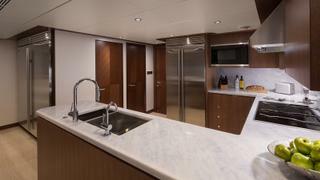 The large galley on the main deck is stylishly appointed with granite worktops and fitted with top of the range appliances, including a Liebherr wine refrigerator and Wolf induction hob. The walk-in pantry has room for weeks of dry goods, while the full-size Sub-Zero refrigerator and freezer will keep everything else fresh. 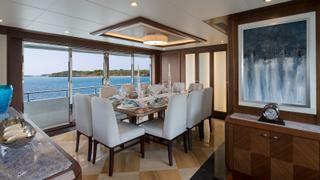 The formal dining room is an elegant light-filled space thanks to floor-to-ceiling sliding doors on the portside. Low cabinets in walnut delineate the space around a comfortable main saloon. 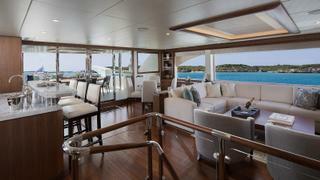 Back outside of the sliding door is a table and banquette set up on the aft section of the main deck, plus one of several bars. 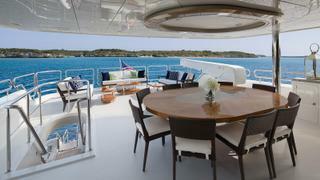 Moving forward along the side deck and up some stairs takes you to an inviting lounge area and table that converts into sunpads overlooking the bow. 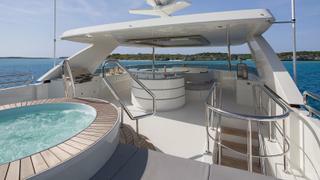 This hull, which made its debut at the Yachts Miami Beach show in February, shows some of the snazzy options available and several modifications from hull No 1. An interesting deal led to the birth of the Ocean Alexander 120. 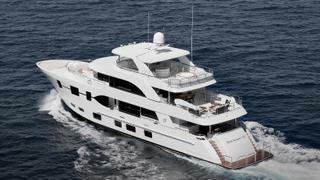 In 2009, Ocean Alexander struck an agreement to build a mini series of three of these Megayachts with American builder Christensen, a true collaboration beyond co-branding, since Christensen built the vessel at its shipyard in Washington state, using its expert craftsmen and local resources but a mould built by Ocean Alexander in Taiwan. Hull No 1 was a stunning blend of burr wood, marble and slick engineering, built to MCA and ABS classification standards and on speculation. It found a buyer in late 2012, opening the way for construction of hull No 2. When Christensen ran into financial difficulties, the partnership ended. 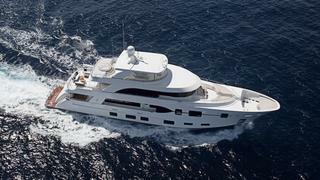 A couple of years passed before Ocean Alexander was able to proceed with the hull and superstructure. In the interim, Ocean Alexander’s president, John Chueh, noticed how popular the superyacht beach club had become and wanted to have one added to the layout. 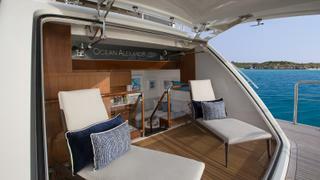 He also decided to complete the build in Taiwan, where the vast majority of the yard’s boats have been built to date, including the popular Ocean Alexander 85 and the new Ocean Alexander 112. Marshall worked with the yard to create a beach club, beautifully finished with Amtico flooring, walnut cabinets and Blue Flower marble worktops. It replaces what was a tender garage on hull No 1, the tender now residing on the bridge deck aft, along with a crane. 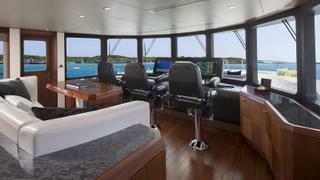 Moving forward and the superyacht wheelhouse is a pleasant space with three chairs facing an array of screens and a wraparound vertical windshield. A quick glance at the instrument panels reveals Trac zero-speed stabilisers, ABT bow and stern thrusters, a full Garmin navigation package and monitoring system among the essentials. Also on the dash are controls for a pair of MTU 2000 M96s, an option on the power package. “With these engines, top speed is 21 knots and cruise is 16 to 17 knots,” Gale says. Even more options are available. 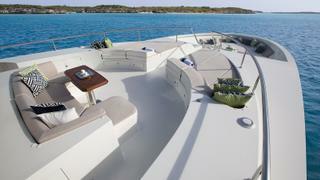 A new Ocean Alexander 120 could be built within 18 months of ordering, says Sally Doleski, marketing manager at the yard. “As long as it doesn’t affect the structural integrity of the yacht, the yard can make almost any adjustment the buyer wants. “We would work with Evan [Marshall] on changes involving layout and materials used to ensure the completed project is the best possible result from the buyer’s desire and meets our requirements for safety and seagoing abilities. We can also build the boat to class depending on the buyer’s requirements.” For example, hull No 2 was built to ABYC standards. Meanwhile, Marshall and Ocean Alexander have continued to work on the Megayacht series, with two more potential models — a 125 and a 155 with great new styling — vying to inherit the title of queen.